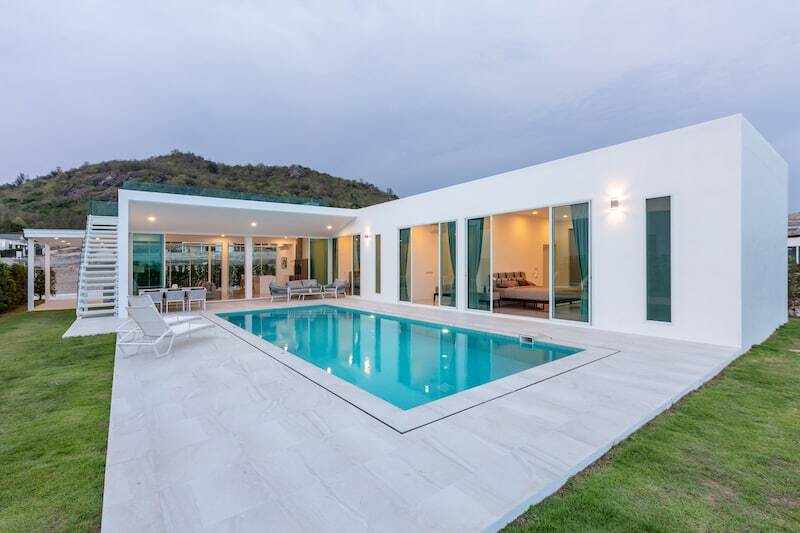 These are off-plan, ultra-modern pool villas for sale in the lovely area of Kao Tao, just south of Hua Hin town center. With an open design, floor-to-ceiling doors and windows, and a bright white color scheme throughout, this is a beautiful home that feels incredibly spacious, elegant and cheerful. The L-shaped floor plan allows for all bedrooms to have direct access to the swimming pool and terrace areas, providing a privacy for guests who can access their bedroom externally without having to go through the main house. The low, green perimeter walls allow for wide, panoramic views, and the location of the development itself is slightly elevated to capture the consistent breeze from both the sea in front and the mountains behind. The kitchens have white, high gloss cabinets, white countertops, and high end appliances. The living room is spacious with high ceilings, and thanks to the full size sliding glass doors, the entire home can be opened up to seamlessly incorporate the indoor and outdoor living areas together. There are various plot sizes to choose from, starting at 560 sqm up to 960 sqm, and prices begin at 8.49 M THB. The land is Chanote, and homes can be owned leasehold or freehold.